MOTOBUYS.com makes delivery of your purchase simple and easy. Just place your order with us and it will be delivered right to your door. FAST! Please keep in mind that it is our goal to ship your order fast after it is placed. We do not ship on Saturdays, Sundays, or Holidays. Any orders placed on Saturday or Sunday will be processed the next business day. Shipping times are average estimates only. Motobuys is a Norton Buy-Safe Accredited Company Buy-Safe has determined that Motobuys meets Buy-Safe accreditation standards, which include a commitment to make a good faith effort to resolve any consumer complaints. Your electronic signature "X" made at purchase confirms you have read the Terms and Conditions of Sale Agreement and Warranty Policy and has the same effect as if You signed it in ink. Electronic Signatures. You acknowledge that by clicking on the "X" button on �I agree to the Terms and Conditions of Sale Agreement and Warranty policy, You are indicating your full intent and full agreement to all terms and conditions of this sale agreement and warranty policy and that your clicking YES shall constitute your signature on this agreement. We ship from five (5)state-of-the-art warehouse facilities located across the USA that carry more than 150,000 high-quality powersports products instock, all ready to ship within 24 hours of your order. Your product order is carefully packed to protect against shipping damage. We use environmentally friendly packing and recycle surplus cardboard, plastic, and other materials. On vehicle shipments every unit is thoroughly checked prior to shipping, to help ensure everything is correct. We also package our vehicles in the safest packaging to further help eliminate shipping damage. Once your order is packed, it is scanned into the tracking system for your convenience. We have trucks that pickup at the warehouses twice daily. Smaller items up to 70 lbs. will ship via "UPS" "USPS" or FED-EX Ground Service. For rush orders, additional shipping charges will apply. Please contact our shipping department for detailed shipping costs. Some items shipped by "UPS" or FED-EX may have an oversize fee, this will cause shipping price to increase. Standard shipping is via USPS, UPS or FED-EX Ground. Next Day Air and 2nd DAY Air deliveries are also available at an additional cost. Please call to verify item stock status and shipping cost. Larger Items (over 70 lbs.) Vehicles! Items over 100 lbs will ship via our direct Truck Line Service. 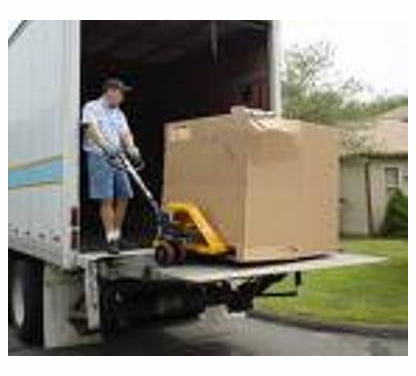 We will arrange delivery with the best freight company that delivers to your area. The freight company must be able to access your home delivery or business delivery with a large truck. Safe and Fast Delivery will be to the shipping address you provided and customer signature and I.D. is required. Our Truck Line will never leave your shipment when your not home. You must be home to inspect and accept delivery. To be sure a safe transaction takes place our shipping carrier will need to check your ID at the time of delivery to match the delivery with ordering persons name and address. * Note shipping times listed or are verbally given on the phone are estimates only. Motobuys does not guarantee any exact shipping time. We do our very best to give you an accurate estimate of shipping and processing times. Order processing is 2-5 business days. Because we use major LTL transportation carriers to deliver vehicles, shipping time averages from 2-7 business days. During holiday seasons, transit time may be longer. Orders may not be canceled or refused due to extended transit schedules. for the best results, if you have a (birthday, holiday gift, etc) always order far enough in advance. We are not responsible for any exact delivery times. Adding assembly option for vehicles can add an extra 14 working days to normal delivery time. * Note that extra shipping charges may apply to New York City area, The Keys and Key West Florida, Parts of Maine and North Dakota. For Alaska & Hawaii call for quote. Get Ready for Vehicle Delivery! It is vital that you inspect your shipment immediately upon arrival and note ANY damages to shipment, including damage to the shipping container. Truck drivers can be pushy, make them wait, so you can inspect the insides of the crate and you will find that 99.9% of the time your vehicle is in perfect condition and ready to assemble. If there is ANY damage to your shipment, you must note this on the BOL (shipping document) when you sign for your package(s). You must also report any damages to Motobuys by email at sales@motobuys.com or by phone at 1-877-667-6289, within 3 days of receiving your shipment in order for us to file a claim for any damages. Motobuys will file the claim for you and ship out replacement parts free of charge. If you do not report damages to Motobuys within 3 days we will not be able to file a claim for you. If a shipment is refused without approval of Motobuys the restocking fee and shipping charges will apply. Your vehicle delivery will not be delivered with out a signature Our shipping carriers WILL contact you to arrange delivery one to two days prior to delivery. Remember, delivery can take an average of anywhere from 3-10 business days from your order date, depending on your location, weather, traffic conditions and time of the year. We use UPS, FEDEX, R and L Trucking, Custom Co and other major carriers for shipping on all vehicle orders. Accessories i.e Helmets will arrive seperately from your vehicle via http://www.ups.com/ . See our FAQ Page for Detailed Infomation or contact us 877-667-6289 M-F 9-5 PST. * Vehicle delivery is guaranteed curbside only or in your driveway if it is accessible. It is the truck lines determination what is safe and accessible for unloading. Steep hill sides, gravel or dirt roads may not be accessible for some large trucks. 1) Select and alternate location that we may deliver your freight to. This alternate location must have a loading dock and/or forklift that is able to remove your freight from the truck bed. 2) Rent a forklift and manually remove your freight from the truck bed. *Please be advised that due to liability issues, the delivery driver will not be able to assist you in any way with the removal of your fully assembled vehicle from the delivery truck. Additionally, the delivery driver will not help to remove the crate from your vehicle or dispose of any of the packaging. Items that are available for immediate delivery will normally ship within 24 to 48 hours. Remember that Saturday and Sunday are not shipping days. There may be a rare instance when we are temporarily out of stock on a particular item. This does not happen often. We will contact you promptly to inform you that the item you purchased is temporarily out of stock. We will contact you promptly to give exact status of any order you place with us. BIRTHDAYS, GRADUATION OR THAT PERFECT HOLIDAY GIFT! MOTOBUYS.com makes gift giving simple. Just fax us a copy of your ID and written request signed by you, asking MOTOBUYS.com to deliver to another address as a gift package. Simply sign the letter and fax it along with a copy of your ID to 818-347-6163 and MOTOBUYS.com will do all the rest for you. If you have any questions just e-mail us or give us a call. Our shipments normally ship out in the evenings between 4pm and 6pm pacific standard time. You will receive your tracking number via email the morning after your order has shipped. Please contact our shipping department with questions. M-F 9-5 PST (877)-667-6289. MOTOBUYS.com will happily exchange any parts, accessories and gear items. WRONG SIZE, WRONG COLOR, NO PROBLEM! Simply call or e-mail us for a return authorization number. just let us know what sizes and colors you would like in exchange when you contact us. A shipping fee may be charged to send the new items back to you if they were shipped correctly. There are no exchanges/Returns for closeout items. Please allow up to 4-5 business days for exchanges to be processed after receipt of the exchange. (EXCEPT VEHICLES see below). A refund for the price paid less our original and/or return shipping costs will be issued to the payment method used at time of order. Fees paid for international duties, taxes and/or brokerage fees are non-refundable. MOTOBUYS.com includes FREE residential delivery as a standard with most vehicle purchases from our online store. Your vehicle is delivered with a lift gate* to lower your vehicle right to ground level for an easy unloading process. The trucking company will contact you 24 to 48 hours in advance to schedule your delivery. All in stock orders are shipped in 1-2 business days after payment. Please call us with any questions - M-F 9-5 PST 877-667-6289 or email us for a fast response. *On some vehicle shipments some larger models of UTVs and dune buggies may have extra delivery charges. Please be advised that due to liability issues, the delivery driver will not be able to assist you in any way with the removal of your fully assembled trike or Off-Road vehicle from the truck bed. Additionally, the delivery driver will not help to remove the unit from the crate or dispose of any of the packaging. * Extra delivery charges may apply for Metro New York City, The Florida Keys, Upstate Maine, Some parts of North Dakota, and rural areas may apply. 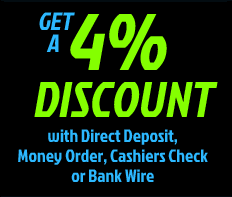 Please contact one of our customer service reps at 877-667-6289 for an additional 3% Non-Credit Card Order Discount on vehicles only! (cashiers check money order, wire transfer, personal check). Customer Responsibilities For licensing of your vehicle purchase in your state. Please understand that DMV laws in every state are different. Make sure you research and understand the DMV laws in your area regarding any vehicle before you make your purchase. Motobuys does not do DMV registration, we provide you with a MSO and bill of sale only. In addition, You must Check your states laws to determine what is required to use your purchase on the street or on public or private land. Motobuys is not responsible for ensuring your purchase is legal to use within your jurisdiction. Some powersports units may be green or red stickered for use in California. This section may not include all customer responsibilities that may apply. All vehicles are packaged in a metal frame surrounded by heavy packing material to protect your shipment. We have shipped many vehicles and the packaging does a great job of getting your vehicle to you safely. The outer packing material may have some marks or little holes in it so check under the material to see if your shipment has any damage. The packaging the vehicle comes in is engineered to protect the inside contents. Marks on the delivery box do not affect the vehicle inside. Truck drivers can be pushy, make them wait, so you can inspect the insides of the crate and you will find that 99.9% of the time your vehicle is in perfect condition and ready to assemble. NOTE: If your vehicle has any damaged parts due to shipping, you must note any damage on the delivery receipt when you sign it at time of delivery, otherwise you are accepting the unit in good condition and you are accepting "Full Responsibility" for any and all shipping damage. Buyer will receive new replacement parts "free of charge" to replace any damaged parts due to shipping if you note damage on the delivery receipt. Failure to note damage on the delivery receipt may void the ability to file a freight claim for you and to provide you free parts from any shipping damage. HOW YOUR VEHICLE IS SHIPPED Unless otherwise specified, the vehicles we offer are crated and on a palette. They are 95% assembled and just require a few basic tools to complete. Delivery location must have easy access for large trucks to make vehicle deliveries. Steep inclines or unpaved roads/driveways may require extra assistance by purchaser or special arrangements to assist in unloading. We strongly recommend that you change the oil and coolant (when applicable) before starting your vehicle. The Oil and Coolant that come in the units is inferior to the quality of those made in the USA and this will help to extend the life of your new vehicles engine. Typical Dirt Bikes- Mount Front tire, Handlebars, Rear shock, Tighten all Wheel Spokes, Depending on the unit, you may have smaller things to install like foot pegs and/or gas cap. The bikes will come with oil already in them. Some assembly and minor adjustments may be required. Typical ATVs- All 4 tires, Handlebars, Utility racks (if included) Depending on the unit, you may have smaller things to install like foot pegs, mirrors and/or gas cap. The bikes will come with oil already in them. Some assembly and minor adjustments may be required. Typical Scooters- Battery, Front Tire, Mirrors, Rear Storage Box, Windshield. The scooters will come with oil already in them. Some assembly and minor adjustments may be required. Typical GoKarts/UTVs/Dune Buggies� Tires, Seats, Top roll cage bars, Steering wheel, and likely a few other small parts. The units will come with oil already in them. Some assembly and minor adjustments may be required. You are responsible for performing the set-up/"PDI" that a dealer would normally perform. i.e.- installing rear view mirrors, setting up and connecting the battery, checking tightness of all screws and wheel spokes, checking and securing all electrical connections, nuts, bolts, changing oil, etc. Items such as lose hardware and parts damaged from loose hardware and components are not covered under warranty. It is advisable to use a thread locking agent such as Loctite on all hardware to help prevent loose of hardware. Occasionally, on some units, it may be necessary to perform other routine checks/adjustments, such as adjusting the setting of the idle speed and fuel/air mixture screws on the carburetor or cleaning it, Mounting and checking tires or rims, drilling out or adjusting mounting holes, cleaning of the carburetor, checking to ensure wires are connected properly, clutch adjustments, adjusting chain slack and alignment(if applicable), in order to achieve optimum performance from your vehicle. Remember, it is your responsibility to check to make sure nuts and bolts are tight, even on assembled units. We will gladly assist you with any additional technical questions you may have. IF YOU ARE NOT COMFORTABLE ASSEMBLING A GAS MOPED, MOTORCYCLE, SCOOTER, ATV, DIRT BIKE, OR ANY GAS OPERATED PRODUCT, WE SUGGEST YOU HAVE A LOCAL MECHANIC ASSEMBLE AND PREP IT FOR YOU. We can ship your new unit directly to a local shop for you. Since you are buying online or via phone order, warehouse direct you are likely saving over half the price of buying from a retail dealership, you will need to perform the final PDI assembly (as stated above). This can take generally 30-90 minutes or more to perform depending on your vehicle and skill level. While we will gladly assist you with any technical support, we will not accept returns on your unit if you cannot perform these functions yourself and/or refuse to let a professional mechanic shop do it for you. By placing an order with Motobuys you agree to these terms as a part of your purchase. LABOR TO REPAIR UNIT OR REPLACE PARTS: Motobuys does not pay or reimburse any labor cost under any circumstances. The Factory Parts Warranty covers any manufacture defect part that are not damaged or broken while riding. The Factory warranty covers motor parts for 3 to 6 Months depending on model, (or unless an extended warranty is purchased) from the date of purchase, the factory warranty only covers motor and electric parts and the parts must be sent in for replacement as required by the factory. The warranty does NOT cover wear and tear parts, initial setup costs OR LABOR. The buyer must diagnose any issues and you can call our tech support assist you to diagnose the problem. Parts for replacement must be shipped back and the new part will then be shipped to you. Motobuys offers for sale extended parts warranties on most models of vehicles we sell. Your parts warranty will be extended by the length of time you select and purchase. All extended warranties are non-refundable after purchase. You cannot buy an extended warranty after the you have received your vehicle. If you ever need assistance with assembly please do not hesitate to call us! M-F 9-5 PST at (877) 667-6289. All Scooters, Trikes or Street Legal Vehicles will receive the MSO (Factory Title) and a bill of sale in the US mail on average 7 to 14 days after the vehicle arrives to you. Most states do not require notary signature on titles. If your state requires notary there is a $15 charge per signature for notary service. You must request notary service if want your MSO notarized. For Off-road vehicles you must request MSO (Title) from us if want a MSO for your vehicle as most states do not require off-road vehicles to be registered. All PRE-approved Vehicle returns will be charged a 25% restocking fee plus original and/or return shipping costs. We strongly suggest our customers please inspect your new vehicle immediately upon receipt before the delivery driver leaves your delivery location and customer must note on the delivery receipt any damage or problems above their signature. If the vehicle is damaged during the shipping, you must contact our Customer Service Department within 3 days and we will provide you with free replacement part(s), & free live telephone technical support within the warranty period. Canceled Deposit orders are subject to a cancellation fee. The customer is responsible for any damage or loss during the return shipping. Vehicles returned within 7 days of receiving must be in 100% new, re-sellable condition. Merchandise is not eligible for refund if it has been assembled, has had fuel put in it, ridden, worn, used, abused or damaged in any way. Vehicle must arrive complete (including warranty cards, manuals, accessories, promotional items, etc.) and in the original un-opened packaging. Must be made within 24 hours after your order is placed. Please call us at 877-667-6289 or e-mail a customer service representative in order to cancel your order. After 24 hours of order placement there is a 15% cancellation fee. Once your order has been shipped it cannot be cancelled without return charges that we incur. If you choose to cancel your order once it has been shipped, you will be charged for all shipping costs and a 25% restocking fee. Please allow 2 to 3 business days for your account to be successfully refunded in full. You will be notified by an email confirmation once refund has been issued. There are absolutely no returns or refunds for any fueled items (if you put gas in the vehicle) or used items regardless of damage or performance! Any unauthorized vehicles returned without a valid RMA number written on the exterior packaging will be refused and sent back to the customer. Freight collect and COD packages will not be accepted. MOTOBUYS.com works hard to ship your vehicle order correctly. If there is any discrepancy in your order, you must notify our customer service department at (877)667-6289 within 48 hours from the receipt of the vehicle. Any items that are returned damaged or used (factory defects not included) will not be accepted, and freight charges will be charged to the customer. No returns or exchanges will be accepted for closeout items. * Liftgate not included on small size ATV's and small dirt bikes. By clicking "Submit Order" or by placing a "Phone Order" , I am authorizing payment from my credit card account, Pay Pal account or any other form of payment I have supplied to Motobuys Inc. for this purchase. I have read, understand and agree to the Motobuys Inc. terms and conditions of sale policy, manufacturers' warranty policies and product return policy. I fully agree to all the terms and conditions set forth in these policies located on this web site at: www.motobuys.com/shipping-info.html . By purchasing any items online (this website) or off-line (via phone or in person), I, as buyer, acknowledge and agree to be above 18 years of age. Buyer understands and agrees that what is posted in writing on this site are the only descriptions and features motobuys claims or offers on any vehicle for sale on this site. Buyer acknowledges to have read and understands the terms and conditions of sale, vehicle listing, description, tech information and features, and by purchasing any vehicle online (this website) or off-line (via phone or in person) has been been informed via the written listing on this site of the vehicles features, description as well as terms and conditions of sale and return policy. Buyer fully agrees that any and all issues will be handled in accordance with the binding terms and conditions of sale policy (found here) and the warranty policy clearly stated on the items listing page. Motobuys reserves the right to refuse service or sell to, cancel orders and or refund payments to anyone. Motobuys reserves the right to change or delete vehicle as well as gear (accessories) listings. Motobuys reserves the right to change feature listings without notice and to ship the new item models without notice as models change. Prices, specifications, and images are subject to change without notice. Buyer acknowledges and agrees that Motobuys.com is not responsible for listed features, typographical or illustrative errors. Titles (MSO's) are created by the factory not Motobuys. Motobuys works diligently to get all titles out promptly. On average MSO's are sent out 4 to 14 days after vehicle is received by you on all street scooters, motorcycles and trikes. In some cases titles can take longer to receive. At no point will Motobuys be held liable for delays or the amount of time the factory takes to ship out MSO's. Electronic Signatures. You acknowledge that by clicking on the "X" button on �I agree to the Terms and Conditions of Sale Agreement and Warranty policy, You are indicating Your full intent and full agreement to all terms and conditions of the agreement and warranty policy and that your clicking "YES" with an "X" shall constitute your signature and acceptance to the agreement.